PATNA: A senior Cabinet colleague of Bihar chief minister Nitish Kumar refused to wear skull cap on his head at a function organized by the Muslim community on Sunday, kicking up a new row. The incident comes at a time when the ruling Janata Dal United (JD-U) led by Kumar—who also heads the National Democratic Alliance (NDA) government in the state—has been trying hard to woo the disenchanted minority class people post the chief minister returning to the Bhartiya Janata Party (BJP) camp two years after winning elections in the company of the opposition Rashtriya Janata Dal (RJD) and the Congress party. Energy minister Bijendra Prasad Yadav had reached Katihar town in Bihar on Sunday to attend the Talimi Bedari conference when the organizers of the function tried to put a skull cap on his head. 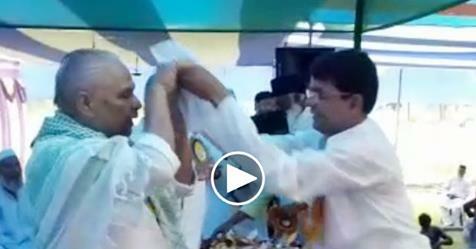 The minister, however, snatched the cap from their hand and instead handed it to someone else standing behind him. The move has drawn strong criticisms from the Muslim class people who accused the JD-U minister of working on the agenda of the BJP. “It was really shocking and surprising to see the minister refusing to wear the skull cap associated with Muslims’ faith and sentiments. It looks like the JD-U too is acting on the agenda of the BJP,” commented Mohammad Salauddin, a Muslim leader. Although the JD-U tried to play down the matter, the incident has not gone down well among the Muslim community whom the party has been trying to convince that its policy and ideology remains unchanged despite the party going in the company of the Hindu nationalist BJP. But the way the minister rejected the skull cap offer has kicked up a new controversy. The bizarre move by the minister also seems to be contradicting the stand of the chief minister Kumar who had earlier said the people in public life have to sometime wear skull cap on head and sometime vermilion marks on forehead. Kumar had made these remarks in April 2013 shortly after Prime Minister Narendra Modi, then the chief minister of Gujarat, had a rally refused to wear skull cap on his head offered by a Muslim clergy.